Introduction: One of my favorite Zelda games from the days of the Nintendo 64, this one was a must have game for me to pick up and try again for multiple reasons. One being I haven’t played it in a very long time and for all I know it could be nostalgia taking hold of my opinion on it, as well as I heard there had been many changes to make things more accessible and interesting. As luck would have it, I was pleasantly surprised with all the new additions to Majora’s Mask as I was expecting it to be merely just a facelift for a new generation, as most remakes have been. Story: The Story of Majora’s Mask begins with Link traveling through the Lost Woods in search of an old friend from Ocarina of time, his old fairy partner Navi. While traveling two fairies scare his horse Epona who precedes to buck him off and knock him out. 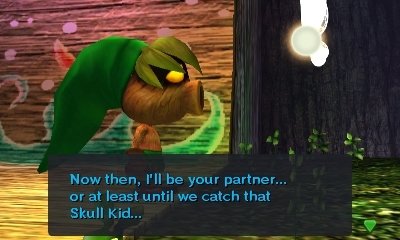 When Link comes to, he sees Skull Kid wearing Majora’s Mask with his Ocarina, which was stolen from him while he was unconscious. Link proceeds to chase after Skull Kid as he goes through the woods, and falls through a hole in a tree, where Skull Kid traps Link and turns him into a Deku Scrub. Skull Kid then leaves Link and Tael, one of the faeries who helped him behind as he proceeds to clock town. Tael asks for Links help to reunite with her friend, and they continue to clock town. When they arrive they are met by a wandering mask salesman who notices Link has met with Skull Kid, and also had something precious stolen from him. The mask salesman offers to help Link so long as he can retrieve both his Ocarina and the mask the Skull Kid stole from the salesman. Although there is a catch, Link has to procure both items in 3 days before the mask salesman leaves the town. 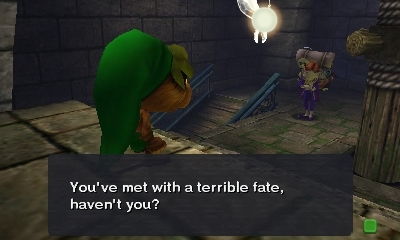 On the night of the third day after adventuring around Clock Town in Deku form, Link confronts the Skull Kid and Tatl, the other faerie and Tael’s brother. 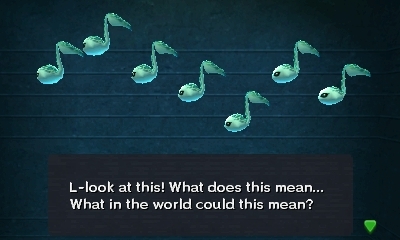 Immediately Tael jumps out front of Skull Kid and exclaims “Swamp, Mountain, Ocean, Canyon. The four who are there bring them here. ” Skull Kid then hits Tatl proceeds to drag the moon down to destroy the world, as Link retrieves his Ocarina that is dropped by Skull Kid. Tael then begins to freak out and ask for the help of the goddess of time for them to have more time, as Link plays the song of time. After the song of time is, played time resets to the beginning of the first day before the end of the world. Link proceeds back to the salesman who then teaches Link the song of healing, and heals the soul of the spirit of the Deku scrub which turns into a mask. Afterwards expecting to have his mask returned by Link the salesman gets upset that he is not in possession of the mask, and proceeds to tell Link the dark history of the mask. Knowing the grave danger and evil of the mask, Link embarks on a quest to find a way to stop the evil mask and Skull Kid, by traveling the land to the four areas Tatl explained in their last meeting. This is one of the darker stories to the legend of Zelda franchise, and one of the only two where Link is not expected by others around him to be a legendary hero. Most NPC’s do not even notice Link in the game as anyone special; just another person in there day to day lives. Even when he wears the different masks that change his form, whatever form he has taken is what people recognize him as. Each mask houses the spirit of a specific person who existed in the world of Termina, and when Link wears the mask that is who people recognized him as. Example: If Link is wearing the Goron mask, he is seen as Darmani the Goron warrior. This makes every situation unique as the story progresses, depending on the mask Link is currently wearing or needs in order to advance throughout the game. This is the darkest story in the Zelda series to date; doom and gloom are common themes throughout the game. As the moon is hovering above the player and NPC’s, waiting to crash down and end the world. All characters have different reactions towards this problem. There are also various other problems going on, which gives rise to the reoccurring use of the song of healing. As Link progresses many NPC’s will need there sorrows/souls healed as they have succumbed to traumatic events. This makes for the most unique story in Zelda to date with a unique game mechanic that has never been replicated. Controls: The controls are an upgrade on the N64 version of the game with use of the touchscreen. This makes it easier manage your items, masks, equipment and events as you progress through the game. Items and masks can be mapped to the x and y buttons as well as I, and II on the touchscreen itself. The A button is used to interact with objects, dodge roll while moving, and B is for various weapon attack’s with your sword. The R button is to block incoming attacks and the L button is used for lock on targeting, as well as to reposition the camera behind the character in whichever way you are currently facing. 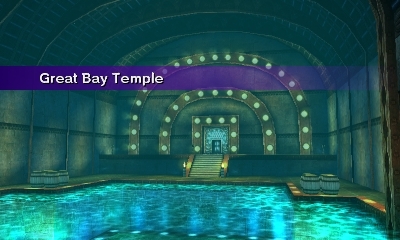 The Touch screen can also be used to access your Ocarina and Camera in the game, and acts as your Map and HUD screen. The controls work really well for the game, although just like other games the DS is shaped awkward itself. So prolonged periods of play does cause finger cramps when using the L and R buttons frequently, although this is a hardware issue not a software issue. Game Play: The Game play is similar to previous installments of the franchise with a few new mechanics. The mechanics I am referring to are the masks Link obtains as he quests through Termina. The first mask obtained is the Deku mask, which allows Link to become his Deku Scrub form. In this form, Link’s abilities consist of an attack spin, which replaces his sword attacks and a Bubble attack as his ranged attack, which costs magic to use. In Deku form, Link is also able to use Deku Scrub pads of which look like flowers on the ground. When Link dives into one of these flowers, he is able to Launch himself in the air and float around for a short period. This is used to traverse areas that are high above ground, and typically out of reach areas. While Link is airborne, he is able to drop Deku Nut’s as though they are bombs onto enemies on the ground. Lastly in Deku form Link cannot swim, although due to Deku Scrub’s being incredibly light he is able to bounce on top of water a short number of times before sinking. The second transformation mask is the Goron mask, which allows Link to transform into an all-powerful Goron. In this form, Link also cannot swim, as he is quite literally a rock creature. Although the Goron form has a high temperature resistance, this allows Link to walk across Lava for a while completely unharmed. In this form, Link’s sword attacks are replaced by powerful punches as well as the ability to roll into a ball. While curled up in a ball Link has two abilities he can make use of one is the Goron ground pound, which allows Link to activate switches that require a lot of weight to be activated. The second ability is while rolling if Link reaches a certain speed, Spikes form on the side of him and he starts traveling fast enough to launch off ramps in order to make long jumps he would not be able to otherwise, as well as damage any enemy he rolls into, be aware though that rolling does consume magic. 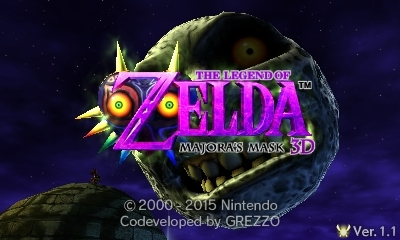 The third transformation mask is the Zora mask, which allows him to transform into a Zora. 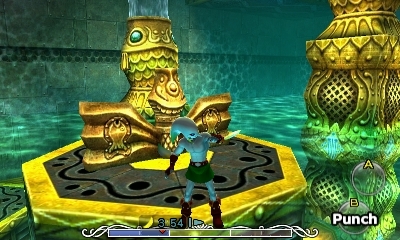 In this form, Link is able to swim underwater and at high speeds; by using the block button to create an electric barrier, which protects, deals damage and increases Link’s speed underwater. In this form Link’s sword attacks are replaced by slashing with the Zora’s fins, which when holding down the B button allows Link to aim his fins, which when released launch as a pair of boomerangs that can damage and stun enemies. 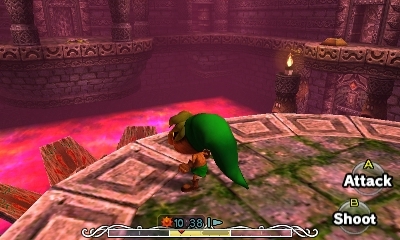 The fourth transformation mask that Link obtains is the Giant’s mask and is only able to be used in a certain room in the game. This mask causes Link to grow giant but also limits his attacks, he is unable to use any weapons other than his fists, and he is very slow. This mask consumes magic the entire time it is worn; it may be useful to stock up on green or blue potions ahead of time. 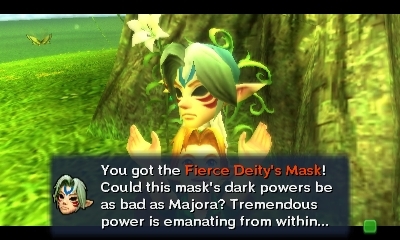 The last transformation mask is the Fierce Deity’s mask, which transforms Link into his ultimate form; this mask can only be obtained if you collect all masks in the game before the final dungeon/boss of the game. In this form, Link wields a very strong two-handed sword, which if you have magic will shoot laser discs from the sword at any targeted enemy. Outside of the five transformation masks there are nineteen other masks in the game to collect, most of which are only used in certain quests throughout the game. A couple worth mentioning though are the Bunny Hood, which increases Link’s walk/run speed. The stone mask, which allows most regular enemies and NPC’s not to see or notice Link, and lastly the Blast mask, which changes link’s sword attacks to explosions which consume some health to use. 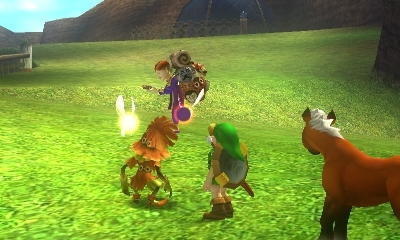 Other than the masks, the items Link can acquire throughout the game are almost identical to that of Ocarina of Time. Link can obtain empty bottles, hero’s bow, bombs, Deku nuts, Deku sticks, hookshot, lens of truth, bombchu’s and the three elemental arrows. All of which are identical to their Ocarina of Time versions, except for the ice arrows and light arrows. Ice arrows can now be used to freeze enemies to use as blocks, which you climb on as well as cold spots in water to use as platforms. Light arrows can be used to remove sun blocks, and can be shot at red gems in a specific dungeon for various effects. As for new items, two that can be obtained, the great fairy sword that works the same as the giant’s knife from Ocarina of time, and the powder keg. The powder keg is a special bomb that only Goron’s can use and causes a massive explosion, of which can remove giant boulders from Link’s path. Outside of the new and old items that can be obtained the games story and progression is mostly linear with tons of optional quests. 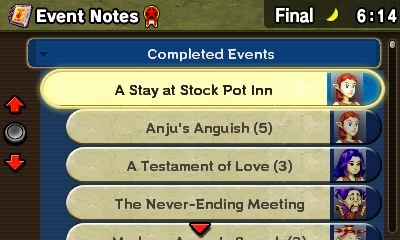 The game often does not give you many hints on what specifically to do, but is simplistic enough to figure out on one’s own for the main story. 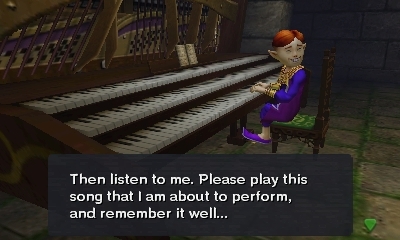 Quests on the other hand can be incredibly confusing in the original Majora’s Mask to follow; this has been remedied by making the bomber’s notebook record more events, and rumored quests then before. This makes tracking optional quests much easier, even though it is up to the player to figure out each step to take in a majority of the quests. Due to the game being on a constant three-day cycle all NPCs have their own day-to-day lives and cycle that repeats. Therefore, the player has to be at a specific event at the time that it occurs to progress in that quest. This mechanic is hardly seen where NPC’s actually have lives outside of standing in the same place all day, and makes Majora’s Mask feel like a real world. In the dungeons themselves, I noticed many improvements went in to changing the boss battles. Those who have played Majora’s Mask before will notice, all bosses have new ways to be fought, and are quite different from before. One boss in particular, I found had changed so much the fight actually was much harder than the original version, and I had to rethink how to go about progressing in the encounter. Overall from what I found in the gameplay there was a lot of care added to making things more accessible for new and old players. As well as something new for those who played the game previously, this made for a very enjoyable experience, and something I did not expect from a remake of an old game. Graphics/Music: Graphics for Majora’s Mask are the best I have seen on the 3ds with only two other games having similar graphics. The handheld itself is quite limited, even when compared to the Playstation Vita. Although does seem to have the potential for Playstation 2 similar graphics. The music is very atmospheric and falls in line with the previous game of Ocarina of Time. Some music though is re-used from the previous game, although most is new and unique for the different areas and dungeons you traverse. Recommendation: If you are a Legend of Zelda fan or action-adventure games this is one worth picking up and giving a try. Even for those who have already played the original, there have been many changes to make things new and fresh. Conclusion: The Legend of Zelda: Majora’s Mask may not be as popular or iconic as Ocarina of Time was, but this does not mean it is not one of the best Zelda games to date. With plenty of changes to make things more accessible, easier to understand for new players as well as challenges for old, I can safely say that Majora’s Mask is still my favorite game in the series. This is how a remake should be done, and should set the bar for future re-masters of classic games.